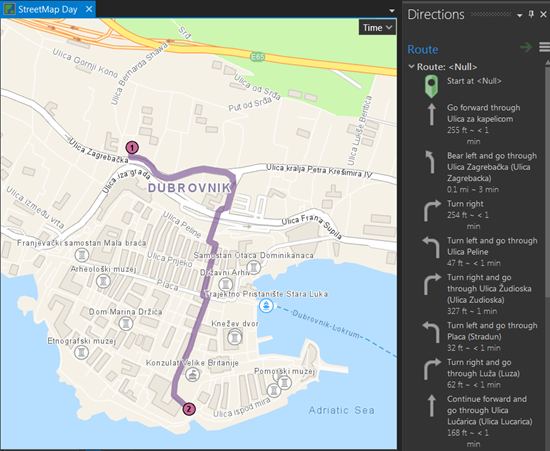 StreetMap Premium for ArcGIS provides enriched street data for use in ArcGIS software to deliver high-quality and multiscale cartographic map display; accurate geocoding (batch, reverse, and simple search); and optimized routing, driving directions, and network analysis. StreetMap Premium is an out-of-the-box solution that is designed specifically to use with ArcGIS Enterprise, ArcGIS Desktop, and ArcGIS Pro. It can be deployed rapidly on-premises behind your firewall with no data preparation. StreetMap Premium is based on commercial street reference data from leading global and local street data suppliers: HERE and INCREMENT P. Data is available for North America, Europe, Latin America, the Middle East and Africa, Asia Pacific, and Japan. StreetMap Premium data is available for use in ArcGIS Enterprise, ArcGIS Desktop, and ArcGIS Pro. The dataset includes detailed basemap data, locators for geocoding, and a network dataset for routing. For more information on the geocoding and routing capabilities for each country available in StreetMap Premium, see product coverage. The standard StreetMap Premium for ArcGIS product, which includes basemap layers and a network dataset in file geodatabase (.gdb) format, locator files for geocoding, and documentation, is downloadable through My Esri. Media may be shipped on a USB flash drive upon request. StreetMap Premium (based on the HERE data) is also available in mobile map package (.mmpk) format available for download and use in ArcGIS Pro by users provisioned with a StreetMap Premium license. A StreetMap Premium subscription includes regular data updates to ensure the most accurate geocoding, routing, and cartographic output possible. Routing—Generate shortest-distance, fastest, point-to-point, or multistop routes. For any route generated, StreetMap Premium takes one-way and turn restriction information into consideration, ensuring route planning is as accurate as possible. StreetMap Premium also includes historic traffic and trucking restrictions data as well. In addition to the routing offered through the Find Route tool within ArcMap, the StreetMap Premium network dataset can also be used with the ArcGIS Network Analyst extension in ArcGIS Enterprise, ArcGIS Desktop, and ArcGIS Pro to provide more detailed network analysis. For details on publishing a routing service on ArcGIS Enterprise, see Tutorial: Publishing a network analysis service in ArcGIS Server help. For details on using a routing service with the Find Route tool, see About the Find Route tutorial in ArcGIS Desktop help. For details on using a network dataset with ArcGIS Network Analyst extension, see What is the ArcGIS Network Analyst extension? in ArcGIS Desktop help. 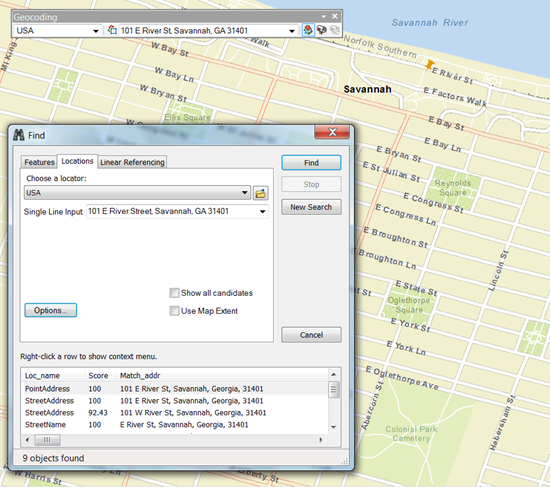 Geocoding—StreetMap Premium locators provide users the ability to geocode addresses individually or in batch mode. These addresses can then be added as stops along a route. You can also perform reverse geocoding, which returns the closest address to an input X-Y location. StreetMap Premium now contains two versions of locators: the classic locators, which have been included for many years now, and the new locators, which were added in near the end of 2018. There is also a new StreetMap Premium offering called the Locator Update, which is available to all StreetMap Premium users. The Locator Updates include the most recent new locators for all regions, that match the same HERE data vintage as the most recent release of the ArcGIS Online World Geocoding Service. The Locator Updates are also available for download through My Esri. For information about the classic versus new locators and the Locator Updates, see the Locators section under Frequently asked questions. For details on publishing and using these address locators on ArcGIS Enterprise, see the About publishing services in ArcGIS Server help and Working with address locators and geocoding topics in ArcGIS Desktop help. Cartographic Display—StreetMap Premium is ideal for high-quality basemaps and cartographic output. Street levels, landmarks, county lines, water bodies, and more are presymbolized. Scale-dependent features, labels, and themes automatically turn on or off according to the zoom level selected.